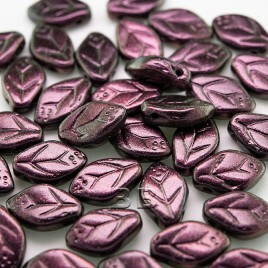 Full Coated Metallic Burgundy 5x7mm Czech Glass Pips. This precision, Czech ‘pip' or ‘petal' shaped glass bead, is a full coated effect. Small lively daisy sized flowers can easily be reproduced when using this bead in rings of six. Alternatively incorporate within your beadwork in an alternative fashion such as within ‘spiral rope' designs or as an edging to jewellery creations.